Most computers come with a wide assortment of clip art for both business and personal use. It is tempting to use clip art in your menu – it is easy to add, with a wide variety of images. But clip art inevitably makes a menu look like it was done on a home computer. It lacks the polish of professional photographs or graphic designs featuring your restaurant’s logo. A graphic designer can help you design something that will make your restaurant menu stand out. Just because you keep a copy of Food Lover’s Companion on your desk, don’t assume your patrons do. Before you start throwing around a lot of culinary terms the masses may not understand, consider your audience. Even if your restaurant is an upscale fine dining establishment, your menu descriptions should still be understandable. A few well-placed terms like sauté or mole (pronounced MOL-lay), will add just enough flavor to your menu, without frustrating customers. And always make sure your staff is trained to answer any questions about the menu. Avoid saying exactly how many pieces of food come in a dish. For example, don’t say “six jumbo shrimp” when describing a shrimp cocktail. Simply saying “jumbo shrimp” will suffice. This way you can adjust portion control to keep your food costs in line. If you have to cut back to five shrimp instead of the advertised six, customers will notice and will feel cheated when they only get five. Most menus will have a disclaimer or two in fine print on the bottom. Common disclaimers include “gratuity will be added to parties of six or more” or “two for one special not available for take out” or “Kids menu available only for those 12 and under.” And those are all fine. Just don’t crazy with the disclaimers. You don’t want to sound like some drug commercial, listing off all things your restaurant won’t do for customers. Fonts are fun to play around with, but when it comes to writing your restaurant menu, simple is best. Sans Serif or Times is the easiest to read in print. Stay away from cursive, all bold or all capitalized text. A 12-14 font is an ideal size for easy reading. Instead, invest in [menu jackets] that have clear sleeves. These allow you to remove menus when they need to be updated or replaced because of wear and tear. 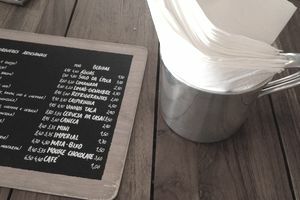 Professional laminating (because we agree that do-it-yourself laminating looks cheap and tacky) will quickly get expensive if you have to reprint your menu every six months, which is not uncommon. And don’t just give it to family and friends! Give it to people who you know will give you an honest opinion. Ask them if it is easy to read, if they understand the descriptions, and does it make your dishes sound appealing?